Please find attached the new CAC Tri-fold Brochure & Mailer in both English (PDF) and Spanish (PDF). 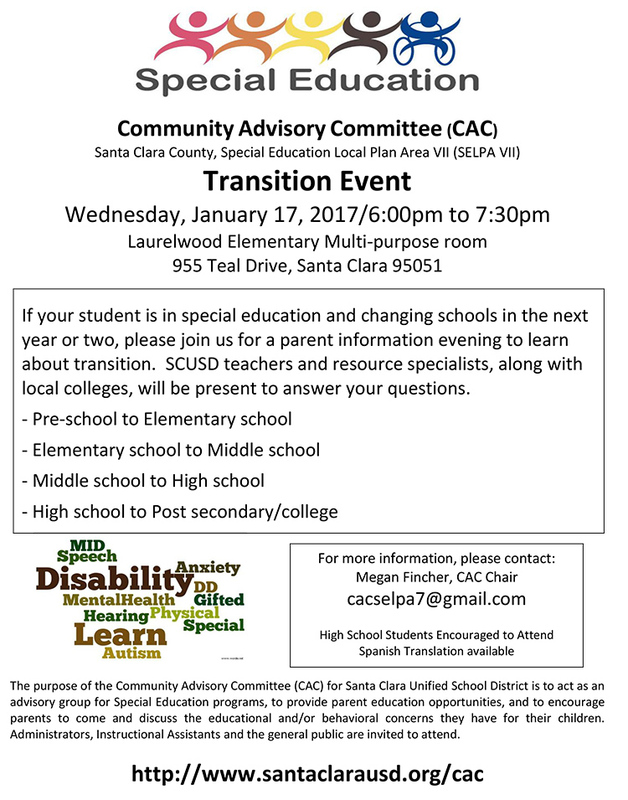 The Community Advisory Committee is a group of parents, educators and community members interested in helping children who have special education needs. Advises the Santa Clara Unified School District Board of Trustees. Recommends priorities and issues to be addressed. Provides input into the development of our local plan for special education. Educates parents, teacher, and others by offering informative meetings and speakers. Have a voice in the District Planning for Special Education. Learn more about the Special Education Process. Network with other parents and professionals. Suggest and implement your own ideas. Please visit the official CAC website for the most current dates and times.